Order the Certified Texas driving record if you’ve been ordered to take a Texas defensive driving course or if you have been required to furnish this record as part of an employment background check. This record will contain your legal name and date of birth, the status of your Texas driver’s license, and any violations in your record. Texas driving records, also known as MVRs, are records that provide a history of violations, suspensions, and other details about a person’s driving history. 1. A Defensive Driving Course Certificate of Completion from a TDLR-approved defensive driving course. When you complete our Online Defensive Driving Course, we will mail your Certificate of Completion to you. 2. A copy of your Driver Record. When you order a copy of your Driver Record from GetDefensive.com, you can obtain it the same day with electronic shipping or in a few days with any of our other convenient shipping methods. 1. Purchase your Driver’s Record. Click “Register” below to begin. 2. If you select the electronic shipping method, you will be able to login to your account within 24-hours and download your record. Otherwise, your driving record will be shipped according to the method of delivery you select during registration: Federal Express or Regular US Mail. After we submit your order form to the Texas Texas Department of Licensing and Regulation, the TDLR will take 7 to 10 business days to process and generate your driver record. The TDLR will then ship your Driver Record according to the shipping method you selected at registration. Driver Records are non-refundable once your order has been submitted to the Texas Texas Department of Licensing and Regulation (TDLR) for processing. If your Texas driving record is not delivered for any reason, please contact our offices at 800-851-3007. 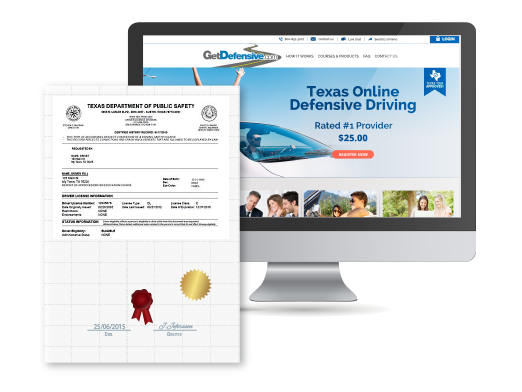 If you got a ticket, many Texas courts require that you furnish a copy of your certified driver record along with a certificate of completion from an approved defensive driving provider like GetDefensive.com. Some employers may also request a copy of your standard driver record as part of a background check. How do I order my driver record? Simply fill-out all of the required information during online registration and we will obtain a copy of your driver record and ship it to you according to the method of delivery you select. How long will it take to get my record from GetDefensive.com? If you select electronic shipping, you will be able to login to your account and download your certificate within 24-hours or less. If you select US Mail, it will typically take 7-10 business days for delivery. Federal Express offers overnight, two day and third day delivery service. Where can I get a copy of my Texas driving record? How shall I pay for taking the Texas online defensive driving course/driver safety course? You may pay for the GetDefensive.com Texas online defensive driving course/driver safety course with either a credit card or with an online check. Payments need to be made before starting the online defensive driving course/driver safety course. Do I need to do anything to get my certificate after I’m done with the Texas internet defensive driving class or driver safety class? Once you have passed the Texas internet defensive driving class, your certificate of completion will be promptly sent out via regular mail. However, if you are in a hurry to receive it, you may choose to have it delivered by FedEx. Please note that is unable to send completion certificates by email or fax. Can GetDefensive.com assure me that the personal information I enter on your website such as my credit card number will be kept secure? Protecting our customers’ private information is one of GetDefensive.com’s top priorities, which is why we use SSL encryption to protect the personal information and identity of our customers. When you sign up to take GetDefensive.com’s Texas online defensive driving course or online traffic school course or online driver safety course, or online insurance reduction course, you can be assured that your personal information (i.e.–your credit card number, address, etc.) is safely guarded. What is the cost of your Texas online traffic school course or GetDefensive.com’s Texas streaming video course or GetDefensive.com’s Texas online defensive driving course or GetDefensive.com’s Texas DVD defensive driving course? GetDefensive.com offers Texas defensive driving school courses and Texas insurance reduction courses. The fee for our online course is $25.00, however if you opt to take the Texas defensive driving video (DVD) course or the Texas defensive driving streaming video course, the fee is slightly higher. $25.00 is the minimum allowable price under Texas state law, which covers the cost of sending your certificate to you via regular U.S. mail. Would I save money on auto insurance if I take the Texas defensive driving online course/insurance reduction online course that offers over the internet? Generally the answer is yes, however we strongly recommend that you ask your Texas insurance agent prior to signing up to take GetDefensive’s defensive driving online course/insurance reduction online course. Many insurance carriers in Texas do offer up to a 10% discount on auto insurance for policyholders who take and pass a Texas Education Agency (TEA)-approved defensive driving course or driver safety course. Also, customers who successfully complete our Texas defensive driving online course/driver improvement online course for ticket dismissal will receive a second copy of his or her certificate of completion for his or her insurance agent. Will I need to take all of GetDefensive.com’s Texas online defensive driving course/online driver improvement course on the same computer? No, you are free to take the Texas online defensive driving course on as many different computers as you wish so long as each computer you use has the flash and browser required to make GetDefensive.com’s page display properly. will automatically check any computer you log in on to make certain it has the needed software to operate correctly. How many hours does it normally take to complete the Texas online defensive driving course or Texas online insurance reduction course offers? I’ve heard it’s pretty long, and I need to find a day when I’m not too busy to take it. Everyone works at a different pace, but normally it doesn’t take more than a half-day or so. However, you do not need to take the entire Texas defensive driving course all at once. Your completed work is saved as you work through the Texas defensive driving course so you can stop and start as often as you like until you complete the course. When I finally finish the Texas online defensive driving course, or the Texas streaming video course, or the Texas driver improvement course, or the Texas video traffic school course, how long does it take your people to get my certificate to me? After you have passed the Texas online defensive driving course, or the Texas streaming video course, or the Texas driver improvement course, or the Texas video traffic school course, will send your certificate to the same address you provided on your registration form via regular mail, which usually takes about 3-5 business days. If you’re in a hurry, you may opt to have your certificate sent to you via FedEx for an additional charge. I got my 4th ticket this year and my insurance company will raise my rates. The traffic court told me that the ticket can be dismissed if I take an accredited driver safety course or an accredited defensive driving course. Is GetDefensive.com’s driver safety course or GetDefensive.com’s defensive driving course which is offered online accredited in Texas? You bet! GetDefensive.com’s defensive driving online class/course is 100% accredited in Texas for ticket dismissal. The court will give you a set time within which you will need to complete the defensive driving class/course and provide your certificate of completion to the court. Some states limit the number of times you can take a defensive driving class to get rid of traffic citations. Do you know what Texas’s rules are concerning this? Texas law only allows drivers to have one (1) ticket removed from their record within a twelve (12) month period by taking a Texas defensive driving course. If you are unsure as to whether you have taken a Texas defensive driving course within the past 12 months, we recommend that you contact the Texas traffic court to see if you are eligible to take ‘s Texas defensive driving online course at this time. What happens if I fail a Unit Exam at the end of a chapter? Texas law requires you to repeat the failed chapter if you do not pass the unit exam. Don’t worry, though, because you can repeat this process as many times as you need in order to pass the unit exam. I work almost every weekend, so I can’t take the Texas defensive driving course or driver improvement course in a classroom. Could I take your Texas online defensive driving course or online driver improvement course instead? Absolutely! offers the entire Texas driver improvement course online which is available 24 hours/day, 7 days/week. Does Texas restrict the number of tickets I can have thrown out by taking GetDefensive.com’s Texas online defensive driving class or online ticket dismissal class? Yes. The State of Texas only allows one (1) ticket dismissal during a 12-month period. If you are eligible for a ticket dismissal at this time, you may take the Texas online defensive driving class or online ticket dismissal class to have a single ticket taken off your record, but you will not be able to have more than one ticket thrown out. If you have taken a defensive driving class within the past year or are uncertain if you are currently eligible for a ticket dismissal, we suggest you either order a copy of your Texas Driver Record or ask the Texas court if you are qualified to take a defensive driving class at this time. Does GetDefensive.com need proof of identity from me when I take the Texas online defensive driving online course? What will do to verify your identity is draw questions from both your driver history/record on file with the Texas Department of Public Safety (DPS) and from your vehicle registration which is filed with the Texas Department of Transportation (DOT).However, if you do not have both a driver history/record and a registered vehicle on file with the State of Texas, you would then need to give us a signed and notarized Statement of Assurance. You would also be asked personal questions you would need to answer as you work through the Texas online defensive driving course. Copyright © 2005 – 2016 GetDefensive.Com – Defensive Driving Online Course. All Rights Reserved.